You’ll find when you choose us for your hi-visibility safety sweatshirts and other products that we strive toward long-lasting products that bring you absolute satisfaction. To assist in reaching that goal, each member of our staff is excited to help you find the perfect items for your unique application. You can contact us at any time to discuss your specifications and ask questions. We even offer customization options for items when you call us at 866-755-9794. First-purchase coupon: To show you our dedication to customer satisfaction and affordability, we allow you to sign up for a first-time purchase coupon to make your order even more cost-effective. 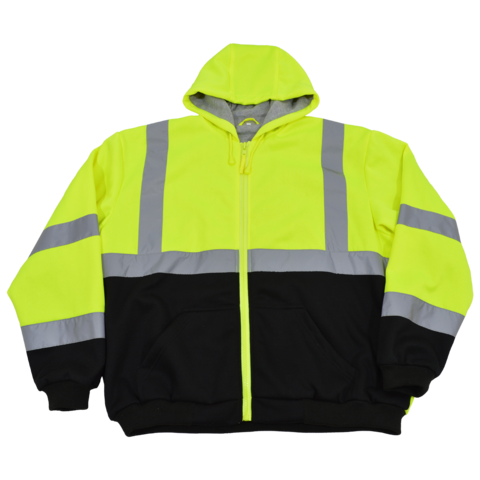 Large selection: Whether you need these thermal safety sweatshirts, hard hats, pavement markings and maintenance items, signs or something else for the industry, you’re likely to find it in our stock. If you have trouble finding what you need, reach out to us so we can help. Purchasing variety: You might want to come to our retail location to try our Petra Roc thermal lined sweatshirts or other gear on. If you do, you can leave the same day with what you need. If you prefer to order online, we can quickly and reliably ship any of your new products to you. Keep the safety, visibility, comfort and functionality of your team top-of-mind while keeping your costs within budget. Shop with D.E. Gemmill Inc. for all the right gear now!